It is believed that spirits come to Kelimutu when people die. The maE (spirit) would leave its village and remain in Kelimutu forever. Before entering one o fht elakes, the spirits would first meet Konde Ratu, the guard of the gate at Perekonde. Which lake the spirit would enter depends on its age and character when alive. The lakes look like colourful paints. The water’s colour changes without prior natural clues.The mineral contained in the water causes the water to change into unpredictable colour. The situation in Kelimutu changes not only due to the lakes colour but also to the climate. It is no wonder this mystical place has become a legend since the old days. Lokal people believe that this place is sacred.” - transcribed from one of the informational signs in the Park. Whether you believe in the mythology or not Kelimutu is a beautiful sight to see. 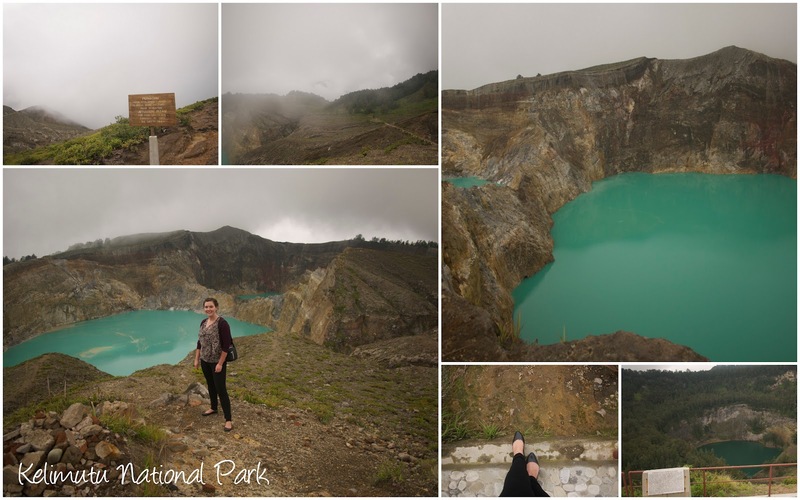 During a planning meeting with the subdistrict in Moni (the closest village to Kelimutu National Park) I was invited to see this national wonder for myself. Not one to turndown such an offer, I happily agreed despite being entirely inappropriately dressed for the adventure. So with two office staff and a driver in tow, we started up the narrow winding road to the park. The drive alone was worth the trip, as you whiz past never ending rice terraces painstakingly carved into the sides of the rolling hills. From the parking lot it is about a 15 minute walk to the first viewing area and another 15 minute walk up to Inspiration point. Thankfully, the fog cleared just long enough for us to gain a clear view of the three crater lakes (all green on the day we visited). If you have the time, it is well worth hiring an ojek (motorcycle taxi) or renting a motorbike to make the trip from Moni up to Kelimutu National Park. There are a number of reasonable priced accommodation options in Moni or it is approximately an 1 1/2 drive back to Ende. Though I would recommend spending atleast 1 night in Moni enjoying the cool mountain air (do bring a sweater as temperatures do drop overnight). Costs: 6,000 IRP or $0.70 entrance fee for foreign nationals.